We use the highest quality CertiPUR™ foam in our mattresses. Our foam is "Open Cell" and chemical free, which means it never off gasses and has No Chemical Fire Retardents! Our fabric covers rely on silica embedded in the fibers(per CA standards). Our memory foam mattresses use a 2.6 lb High Resiliency foam for our base layers and 5.0 lb visco elastic memory foam for the top layer. Also known as visco elastic foam, memory foam is a heat-sensitive, polyurethane foam. At room temperature memory foam is harder than at skin temperature, which causes it to soften on contact and mold itself to the shape of a warm body within a few seconds. The foam also holds its shape temporarily - a hand pressed into memory foam will leave a clear impression when removed. Memory Foam was developed for use in the space program. The hope was that memory foam, because of its ability to distribute pressure across the entire surface, could ease the pressure of extreme G-forces. While memory foam was never used in the space program, it was subsequently used in medical applications, for example where a patient suffered from pressure sores or had to be bed-bound for a long period of time. Initially memory foam was too expensive for general use. In recent years visco elastic memory foam has become cheaper to produce and is now widely available for the home bedroom. The most common domestic applications of memory foam are in mattresses, pillows and mattress toppers … A memory foam mattress is usually denser than an ordinary foam mattress. This makes it more supportive. Wikipedia explains memory foams are unique in two ways. First is the way memory foams respond to changing pressure. Unlike standard foams that spring back immediately, memory foams recover slowly. This "slow recovery" accounts for the way memory foams conform to your body's shape to reduce pressure points. Second, memory foams are temperature sensitive. At room temperatures, memory foams are firm. But as your body warms them, memory foams become softer, more pliant and more elastic. So memory foams are also known as visco elastic foam. This temperature sensitivity further reduces pressure points, thus increasing support and comfort. Reports note sleepers toss and turn less on memory foams and experience more REM sleep. Both "slow recovery" and "temperature sensitivity" create the feeling you get while lying down on the densest memory foams. All mattress foams are open-cell, unlike closed cell insulation foams. "Open-cell" foams breathe. The circulating air takes away body heat and humidity constantly. Foam mattresses are resilient and inert. They contain NO noxious gases whatsoever. Mattress foams, unlike organic materials, are allergen-free. They do not mildew or cause allergies. For asthma sufferers, foam works wonders. Memory Foam mattresses are naturally resistant to dust mites and bed bugs, as it does not create a habitat for them to survive. For our beds, we offer 2.6lb High Resiliency foam mattresses in Twin, Twin XL, Double/Full, Queen, Split-Queen, Split-King and Studio 30x80 for our daybeds and analytic couches. Polyurethane foam is specified with four numbers (i.e. 2635); the first two (26xx) refer to the foam density, and the second two (xx35) refer to the foam firmness. Each measurement is independent of the other. Firmness does not affect density, and density does not affect firmness. Foam with a 2635 specification refers to a 2.6 lb High Resiliency foam with a 35 ILD. Density is a measurement of the foam quality. The higher the density, higher the quality and thus, the longer they last and more they cost. Polyurethane foam density will range from 1.0 lbs/ft3 to upwards of 7.0 lb/ft3. Foams that range between 1.0 lb and 1.2 lb are referred to in the industry as "low density", whereas 1.8 lb to 2.0 lb are "high density" and 2.5 lb to 2.6 lb are "high resiliency". 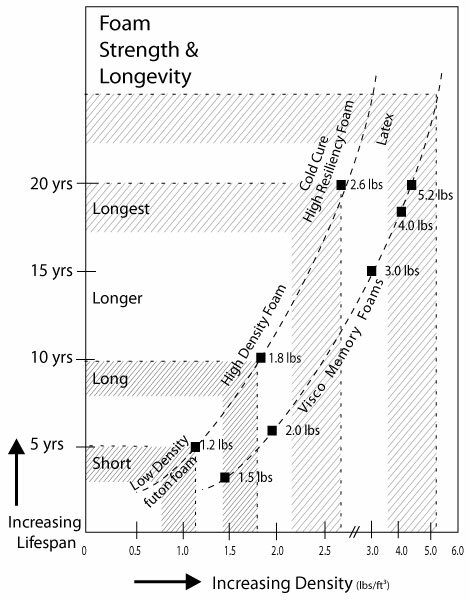 Pure high resiliency foams will have a lifespan of over 20 years with everyday use. 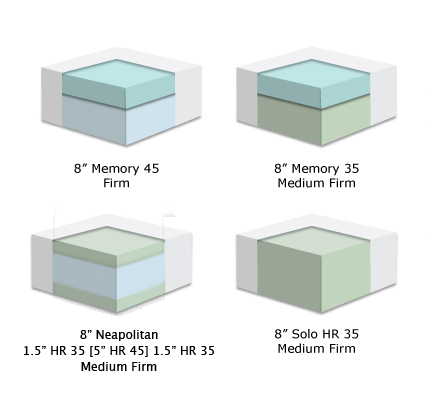 Visco elastic memory foams are generally denser, from 3.0 lb to 7.0 lbs/ft3. Indentation Load Deflection or ILD (also known as IFD, Indentation Force Deflection) is a measurement of polyurethane foam firmness. It refers to the amount of force, in pounds, required to indent 4 inches of foam 25%. Higher the ILD, firmer the foam. Polyurethane foams come in a wide range of ILDs, most commonly 23 ILD or 27 ILD (for upholstered seats, couch cushions and soft mattresses) to 35 ILD or 45 ILD (for firmer seats, cushions or mattresses), but are available in ILDs both higher and lower than that. In contrast, premium foam mattresses appear a much better value. Bedworks' High Resiliency and Memory Foam Mattresses carry 20 year warranties. They cost less, are healthier, slimmer and more attractive, easier to move, and guaranteed to last twice as long as spring mattresses. Foam density is also a measure of its quality. Lower quality (and therefore less expensive) foam mattresses use a lower density foam, which does not last nearly as long as High Resiliency foam. Don't be fooled, especially with memory foam. Ask about the density to get a better idea of its quality. We use 2.6lb High Resiliency foam and 5.0lb Memory foam in our hand-layered bed mattresses. Polyurethane foam is specified with four numbers (i.e. 2635); the first two (26xx) refer to the foam density, and the second two (xx35) refer to the foam firmness. Each measurement is independent of one another. Firmness does not affect density and density does not affect firmness. Foam with a 2635 specification refers to a 2.6 lb High Resiliency foam with a 35 ILD. Density is a measurement of the foam quality. Higher the density, higher the quality and thus, the longer they last and more they cost. Polyurethane foam density will range from 1.0 lbs/ft3 to upwards of 7.0 lb/ft3. Foams that range between 1.0 lb and 1.2 lb are referred to in the industry as "low density", whereas 1.8 lb to 2.0 lb are "high density" and 2.5 lb to 2.6 lb are "high resiliency". Pure high resiliency foams will have a lifespan of over 20 years with everyday use. Visco elastic memory foams are generally denser, from 3.0 lb to 7.0 lbs/ft3. "Really pleased with the desk and the service. Thanks!"